Pre-heat a grill or grill pan to medium-high. In a large bowl, combine the ground beef, parsley, dill, chives and Worcestershire sauce; season with salt and pepper. Divide the mixture into four mounds. Press one piece of cheese into the center of each mound, then form a patty around the cheese. Drizzle the patties with EVOO and grill for 4 minutes on each side for medium doneness. Meanwhile, in a small bowl, combine the sour cream, mustard and honey; season with salt and pepper. Layer each roll bottom with lettuce, cucumber, radish, onion and a burger. Spread the honey mustard sauce on the cut side of the bun tops and set into place. In Recipes-list.com we have selected the most viewed recipes from category - uncategorized . Enjoy the best recipes specially selected for you! 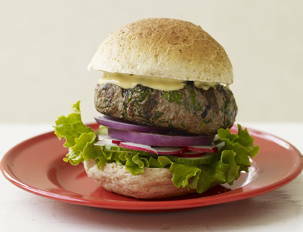 Audacious, Herbaceous Beef Burgers is the right choice that will satisfy all your claims.